Because I am extremely prone to on-the-spot food cravings, I keep myself armed with Mark Bittman's How to Cook Everything iphone App. At exactly 11am my stomach demanded chunky tomato soup and grilled cheese for dinner, so I whipped out my phone where Mark presented me with a plethora of possibilities: pureed tomato soup, wintertime tomato soup, tomato and bread soup, tomato-garlic soup....I combined my favorite elements of each to produce this hearty, satisfying, Grilled-Cheese Perfect Tomato Soup. You can't be fooled with tomato soup: when its good, its really good. Mark explains that the trick to producing a quality tomato soup is tomato paste: "Most tomato soups are simply not tomatoey enough," he explains, assigning paste the role of adding "depth that even good fresh tomatoes sometimes lack." Tomato paste is indeed the foundation of this soup recipe, as it is the first ingredient added to the oil and coats the veggies as they saute in the pot. I added garlic and celery to the onion and carrot, as I wanted my soup to be thick and chunky for optimal grilled-cheese dipping. My next ingredient was canned stewed tomatoes, which take 15 minutes to "break up" and produce an enticing aroma as they do. I ended up using an immersion blender briefly at the end to produce my desired consistency, but the tomatoes got so soft they could easily be smashed with a fork too. 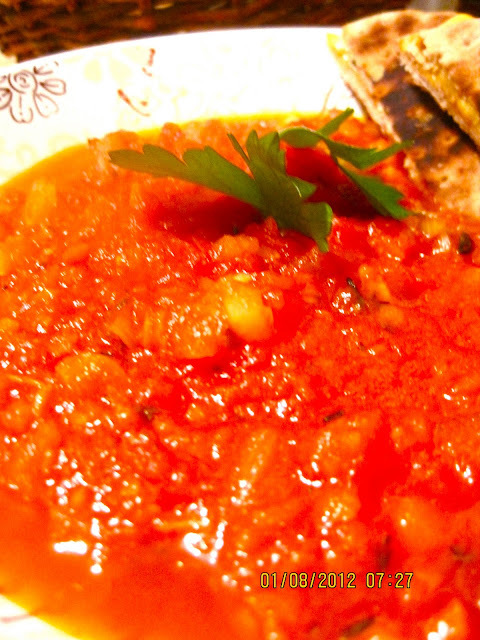 Sugar plays a key role in the soup as well, adding that special sweetness to the natural acidity of the tomatoes. I also added in a generous tablespoon of balsamic vinegar at the end, which served to enhance the sweetness even more. The result was a hearty, chunky classic tomato soup that I devoured in about .5 seconds with my whole wheat and cheddar grilled-cheese. Craving adequately satisfied? Check! 1. Put the oil in a large, deep pot over medium heat. When hot, add the tomato paste and let it cook for a minute, then add the onion, garlic, carrot and celery. Sprinkle with salt and pepper and cook, stirring, until the onion begins to soften, about 5 minutes. 2. Add the tomato and the herbs and cook, stirring occasionally, until the tomato breaks up, 10-15 minutes. Add the stock, stir, and cook until hot, then adjust the heat and simmer until the flavors meld, about 5 minutes. Add sugar and balsamic vinegar, taste and adjust the seasoning. If the mixture is too thick, add a little more stock or water. Garnish with the herbs and serve.